This is Bob from Bolingbrook. I went and saw the Love and Mercy film last night and tho I'm no Chet Coppick, (love ya Chet!) I thought I'd comment on what I thought. Yes, Brian Wilson is obviously much more complex than what the movie showed. I also agree that John Cusack was ok (not great) as the older Brian, and I wonder if they could have searched a bit harder for someone who might have looked a bit more believable as the older Brian. Paul Dano I thought did and looked a great part. I know you only have so much time to tell a story, but those of us who have read about Brian for so many years knows that there is also lots that was not touched on. A few facts that I always enjoyed about the Beach Boys: 1. Dennis was the only Beach Boy that could surf, yet he was the one who drowned. 2. When the Beatles first took to the airwaves, Brian was obsessed with trying to hear their sound and arrangement and vocals. He supposedly locked himself in a room / home for weeks to listen to their music over and over to find that inspiration. 3. When Brian first heard Be My Baby by the Ronettes, he so loved that song that he wrote Don't Worry Baby and offered it up to Phil Spector. Phil told him that this song would not become a hit ... I think it's one of their very best with that California sound, the harmonies etc. 4. Yes, it's well documented about Gene Landy, but I'm sure we are merely seeing one side of that story. 5. They actually took the wardrobe and look of the Kingston Trio with the red-striped shirts to provide them the wholesome young trend at that time. 6. I thought they were good friends of Jan and Dean in the early going and it would have been super cool to show a small part of the collaboration with them as part of this film. 7. We all know of the huge ego that Mike Love had, and who can forget all of his womanizing and his wanting to be the focus point of most songs. I do think the person who played Mike Love did well. 8. It was great to see some acknowledgement of the Wrecking Crew. Hal Blaine was an absolute genius and it was nice to see at least his name mentioned and a few scenes. We all know what the drug scene was like back then, but I'm glad they didn't focus all on that. I would have liked to seen some more scenes (and music) of the early years when they first started to sing and arrange in the Wilson home. Surfin' would have been a great song for them to show starting off (I believe it was their first hit). Also, the long and well documented rift between Murry and the boys (not just Brian) was glazed over. Funny how they never really showed them on tour or singing in front of huge live audiences? All in all I give it 3 stars out of 5. I think there is so much left out that it's next to impossible for anyone to make a movie that can include all that went on. I also believe back many years ago our very own Chicago DJ - Steve Dahl - helped co-produce a very good movie on the Beach Boys (I think it was called Summer Dreams) and they actually did a great job of capturing that California time and of course the sound. Unless you are a HUGE Beach Boy's fan, I would honestly say to wait till this gets released on DVD. If you haven't had a chance to listen to the re-release of Pet Sounds where a few of the songs were done just with vocals, you REALLY need to check out the song Wouldn't It Be Nice, just to hear those vocal arrangements that made Brian Wilson the genius that he is. It's worth a listen. Happy 4th of July to all Forgotten Hits fans! I love how much thoughtful discussion you have devoted to the film and, because we've been friends now for so many years, I have mercy for your differing a view points. THIS IS GARY SABOURIN FROM RANCHO MIRAGE, CA. 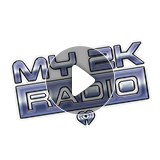 I STUMBLED ONTO A VERY INTERESTING RADIO STATION ON TUNE IN RADIO TODAY! 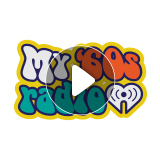 IT IS NOT AN OLDIES STATION AS YOU HAVE DESCRIBED, BUT PLAYS 60S 70S AND EARLY 80S WITHOUT ANY COMMERCIAL INTERRUPTION AND NOT ONE REPEAT PLAY! THE IDS AND LINERS SOUND LIKE THE 60S POP STATIONS WE GREW UP WITH. WHOEVER IS PROGRAMMING THIS GEM IS REALLY REALLY GOOD! GIVE IT A LISTEN IF YOU CAN FIND THE TIME. I just discovered your great blog, which overflows with information, enthusiasm, and passion. I host a weekly radio show in Central Florida, on WPRK 91.5 FM. 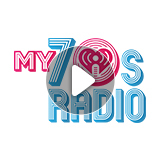 Below is a link to a 2-hour interview with Colin Blunstone and Rod Argent of The Zombies (within a 4-hour program devoted to the group). Recorded in-studio on their 2014 US tour, I think you'll enjoy. It was nice to read Dennis Tufano's kind raves about the group on your blog (and his is an underrated voice, isn't it?). My 2KFrom Dance-Pop to Indie Rock with a dash of Emo. 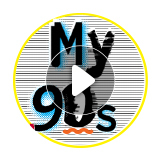 Grunge, Gangster Rap, and Boy Bands. My 80sFrom Michael to Madonna. 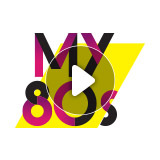 All the 80s hits! My 70sTake it back to the land of Disco. My 60sThe Beatles through Woodstock. Groovy, baby. Throw it back to the birth of Rock 'n' Roll. Once an hour they're playing the top 3 songs on the 4th of July in past years. If it was up to me, I would've played the top 4 songs for the 4th of July. 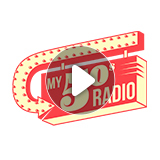 55- Unchained Melody by Les Baxter; 56 - Standing On The Corner by The Four Lads; 57 - Teddy Bear by Elvis Presley; 58 - Witch Doctor by David Seville (when's the last time you heard THAT one on the radio?!?!? ); 59 - Dream Lover by Bobby Darin; 60 - Because They're Young by Duane Eddy; 61 - Raindrops by Dee Clark; 62 - It Keeps Right On A-Hurtin' by Johnny Tillotson; 63 - Blue On Blue by Bobby Vinton; 64 - Don't Let The Sun Catch You Crying by Gerry and the Pacemakers; 65 - Wooly Bully by Sam The Sham and the Pharaohs; 66 - Paint It Black by The Rolling Stones; 67 - San Francisco by Scott McKenzie; 68 - Yummy Yummy Yummy by The Ohio Express; 69 - Too Busy Thinking About My Baby by Marvin Gaye; 70 - The Long And Winding Road by The Beatles; 71 - Rainy Days And Mondays by The Carpenters; 72 - Lean On Me by Bill Withers; 73 - I'm Gonna Love You Just A Little More Baby by Barry White; 74 - Be Thankful For What You've Got by William DeVaughn; 75 - I'm Not Lisa by Jessi Colter; 76 - Sara Smile by Daryl Hall and John Oates; 77 - Da Doo Ron Ron by Shaun Cassidy; 78 - Take A Chance On Me by ABBA; 79 - We Are Family by Sister Sledge; 80 - It's Still Rock And Roll To Me by Billy Joel; 81 - Jessie's Girl by Rick Springfield; 82 - Heat Of The Moment by Asia; 83 - Time by Culture Club; 84 - Self Control by Laura Branigan and 85 - Raspberry Beret by Prince. Sony has successfully defended their intellectual property and stopped the release of the film The Beatles: The Lost Concert. The film was based around 35 minutes of footage obtained by Ace Arts of the band's first U.S. concert on February 11, 1964 at the Coliseum in Washington, DC. Additional footage, photos and interviews were used to flesh out the show to make a 92 minute documentary. On May 6, 2012, Ace Arts and Screenvision had planned on showing the film in 500 theaters across the U.S. before Sony and Apple Corps successfully obtained an injunction to shop the presentation. Ace Arts subsequently sued Sony and ATV, saying "At the eleventh hour, in mid-April 2012, Sony / ATV, at the insistence of, and in conspiracy with, Apple Corps, wrongfully interfered with the distribution contract by making false statements to exhibitors, theater owners and potential distributors concerning Ace’s legal right to exhibit the documentary, making unjustified threats of legal action and filing a baseless lawsuit in England." On Wednesday, Sony Corp won a final court battle in the U.K. that found that Ace Arts had infringed Sony's copyrights in both England and the U.S. The judge based the verdict on the fact that Sony owned the rights to eight of the twelve songs that the Beatles performed that night. Noted Beatles Artist Shannon will be unveiling her latest work, The Beatles / Shea Stadium painting at the Danbury, CT, "Fab 4 Music Festival," New York / New England's only regional Beatles-themed outdoor Music, Food & Arts festival being held this year on Saturday, August 15, 2015. Not so coincidently, The Beatles played their historic first Shea Stadium concert on August 15, 1965. This brand new artwork by Shannon reflects that momentous occasion, 50 years later to the exact date. Fans will "come together" at Ives Concert Park, 43 Lake Ave Ext, on the campus of Western CT State University, in Danbury, Connecticut, for a celebration of the Shea concert anniversary. Doors will open at noon, and the music will continue until 8pm. The event, also billed as "Danbury Fields Forever," is in its fourth year, and is a family-friendly event with music and attractions for all ages. Shannon is widely regarded as "The World’s Greatest Beatles Artist," a name bestowed upon her by the Lord Mayor of Liverpool in 1998. Shannon started gaining attention by entering a Beatles Art Contest in New York twenty five years ago, where she won the first prize. She soon began to tour Beatles festivals around the world with just an airbrush and electric eraser, painting at live events to showcase her Beatles artwork. Her success was immediately recognized across the globe, especially in Liverpool, where she created all the artwork for the historic Hard Days Night Hotel. Sir Paul McCartney owns a Shannon portrait, and her work has been praised by John Lennon’s sister Julia and his first wife Cynthia. Ringo Starr is rumored to have a piece of Shannon’s artwork in his studio, depicting him and John together. The Fab 4 Musical Festival's producers commissioned Shannon to create a special design of The Beatles at Shea Stadium using four separate images she had painted of John Lennon, Paul McCartney, George Harrison and Ringo Starr in their 1965 Shea jackets. These will be on display at the event along with many of Shannon's other famed Beatles images. Shannon will be one of the special guests of honor at the festival. The musical artists performing will be: The Hofners, The Blue Meanies, Penny Lane, The Oh Nos, Number Nine, The Navels, AfterFab, Strictly Beatles and School of Rock. The Hofners will be recreating the entire Shea Stadium concert with some other surprises from the year 1965. To celebrate the 50th Anniversary of The Beatles' Shea Stadium concert in 1965, full-day advance "Ticket to Ride" admissions to the Fab 4 Music Festival are only $19.65 available at: https://www.eventbrite.com/e/beatles-music-festival-2015-danbury-fields-forever-fab-4-music-festival-tickets-14945919648. There are also V.I.P. tickets available and hotel packages. Tickets will be higher at the door. In addition to the music, there will be more Beatle and memorabilia dealers and vendors, exhibitors, attractions, along with a large variety of food options available. With a full day of fab four fun, as The Beatles sang, "It's Guaranteed to Raise a Smile." For further info, visit website: www.Fab4MusicFestival.com, email: info@Fab4MusicFestival.com, or phone (203) 795-4737. Shannon's art can be seen at www.theshannongallery.com. I am surprised Larry did not mention the KOMA and OKC hit version by George Martin! YES, THAT George Martin! It is EXTREMELY alike to the Sounds Orchestral version. His version was top 10 EXACTLY 50 years ago this week on KOMA. I have the survey, but no time to find and scan right now. Here's what was on it. This was the first week that our family was in OKC for a month stay while my dad was at radio school for the FAA. It was a great month listening to WKY and KOMA battle in OKC for radio supremacy. We got to see Roger Miller and Gary Lewis & Playboys live while there. 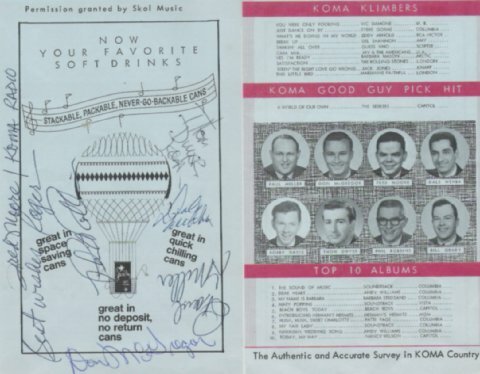 The KOMA Good Guys signed my survey at the latter show. Seeing the DJs was almost as important as seeing Gary Lewis. It was a great time. Little did I know that I would work on CDs by artists containing the hits here and holding #1, 21, 23, 31, 40 positions, as well as the O'Jays' KOMA Klimber! Next week in NYC, at cabaret-club 54 Below, Monkee Micky Dolenz debuts a new show called A Little Bit Broadway; A Little Bit Rock ‘n Roll, and we have an exclusive peak into his rehearsal sessions held last week. Working with a new band, with music director Michael J. Moritz, Dolenz performs several Broadway numbers that are simply sensational. The shows are July, 7, 10, and 11 ... a live album will be recorded and released on Broadway Records in September. We have a news release for you about an artist with whom I think you are familiar. Hope you find it interesting! BOSTON, MA – June 18, 2015 – A 1970 classic rock hit by singer-songwriter Burton Cummings and his former band, the Guess Who, is becoming a hot topic in sports advertising. But unlike Cummings’ other songs, “American Woman” wasn’t "written." The artist’s Boston promoter, AW Productions, LLC, says, “The legendary hit offers evidence of what Burton Cummings’ quick mind can do in a pinch.” Talking in a parking lot between shows, he lost track of time. Hearing his band playing riffs without him, the lead singer raced back on stage and improvised what became the group’s best-known song. Since the original 1969 recording reached No. 1 on Billboard's "Hot 100" and No. 3 song for the year 1970, “American Woman” has been covered by countless artists, featured in the film American Beauty, and recorded by Lenny Kravitz for Austin Powers’ The Spy Who Shagged Me. Amid growing praise for the Nike commercial, a few commenters on YouTube wonder about possible “anti-American lyrics” or an American team song written by a Canadian. Cummings disavows political intent in his improvised lyrics, and as a dual citizen, has resided for decades in both Los Angeles and Canada. He tours in both countries and, in Las Vegas, entertains Americans, Canadian curling conventioneers, and visitors from around the world. In a global environment, Nike’s music choice serves as an inspirational theme for Americans competing among international teams and venues as well as for Nike’s women customers of all nationalities. 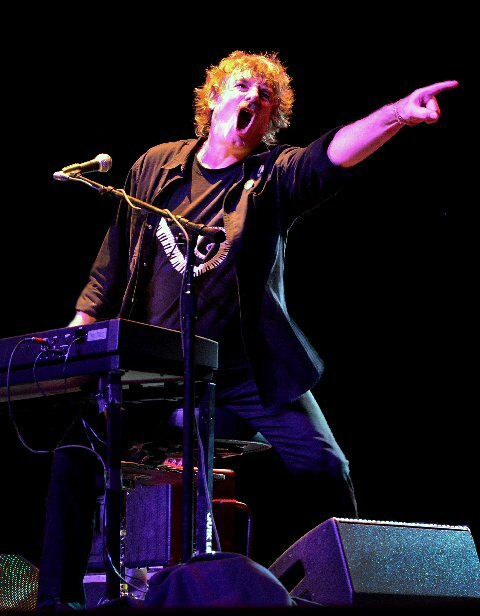 Currently performing both solo and with his band, Burton Cummings is scheduled to bring his show, “Up Close and Alone,” to Boston’s Berklee Performance Center on October 3rd. For more information about the concert, presented by AW Productions, LLC of Plymouth, MA, visit www.awproductions.rocks. ELO front man Jeff Lynne is supposed to be coming to the US for a series of shows ... and we can't wait to see him!!! New York, NY (June 29, 2015)--On September 11, 2015, Eagle Rock Entertainment, in association with the BBC, will release Live In Hyde Park by Jeff Lynne’s ELO on DVD, Blu-ray and digital formats [MSRP TBA]. This release offers fantastic value with a full-length concert and feature-length documentary on the same disc. The show from Hyde Park includes ELO’s hits “Mr Blue Sky,” “Sweet Talkin’ Woman,” “Livin’ Thing,” “Evil Woman,” “Telephone Line,” “Don’t Bring Me Down,” “Showdown,” “Roll Over Beethoven,” “10358 Overture,” “Can’t Get It Out Of My Head,” “Strange Magic,” and many more! The Electric Light Orchestra, led by one of rock’s most iconic songwriters and producers Jeff Lynne, is one of the most successful bands of all time with global sales of over 50 million albums. In September 2014, Jeff Lynne’s ELO headlined BBC Radio 2’s “Festival In A Day” in London’s famous Hyde Park. It was the first time in almost 30 years that the band had performed on a festival stage. Jeff Lynne said, “It seemed like the entire 50,000 were singing and clapping along, which carried on for the whole night. The Hyde Park concert turned out to be one of the most memorable shows ever for me”. This show was a truly special moment that will live on in fans’ memories forever - the 50,000 tickets for the event had sold out in a matter of minutes and the fans sang along to hit after hit performed by Jeff Lynne and the band accompanied by the BBC Concert Orchestra. Live In Hyde Park by Jeff Lynne’s ELO will be cherished by all who love this truly important band. 7/1/2015 - Billy Joel breaks the tie he had with Elton John for most appearances at Madison Square Garden with his 65th concert. 7/1/2015 - Bruce Springsteen is a surprise guest at Brian Wilson's concert at the PNC Performing Arts Center (New Jersey).He sings harmony on " Barbara Ann. " I recently viewed an info commercial for live performances of the R&R Hall of Shame inductions. I noted that almost EVERY song shown was a classic 60's / 50's rock song. There were none by these newer artists or obscure artists being put in constantly. SO, why does the hall think those should be in when their own DVD has mostly performances by the big heavy weights?? After taking in the national news last week, and watching President Obama singing "Amazing Grace" as part of his eulogy at the South Carolina funeral service, I couldn't get the song out of my head. I kept hearing the instrumental version, featuring bagpipes, as I tried to sleep that night. Time and again, bagpipes have been voted the least popular musical instrument in the world, so I was surprised when the song by The Pipes and Drums and the Military Band of the Royal Scots Dragoon Guards (There's a name for ya!) became a pop hit in '72. Judy Collins had a hit with it a year before and, as much as I love Judy, I couldn't wait for both versions to make it to the end on the radio. There is one recording featuring bagpipes, however, that I actually like: "Bonaparte's Retreat" by Glen Campbell. It's fun to hear all the instruments play at the same time, as the song winds down; very cleverly put together! I don't know how far it made it up the charts, but I used to hear it played a lot. I once saw Campbell sing the song and play all the instruments (including the bagpipes) on TV. Monday, I watched "I'll Be Me", but got bored with it after an hour and 20 minutes, so I turned off the TV. Now, I will have to view the last 40 minutes, to see his session with "The Wrecking Crew". Unfortunately, the only time I heard him in person was when he toured with The Beach Boys. When I first saw the title of Charlie Gracie's latest CD, ANGEL ON MY SHOULDER, I thought immediately of the 1961 Shelby Flint tune. Also, with the mentioning of Joe Bennett's passing, I am reminded of the first four records I ever bought as a kid. Really can't remember which was first, second, third, or fourth, but his BLACK SLACKS was one of them. I drove my parents crazy playing that record over and over on my record player in my bedroom. The other three were MOONLIGHT GAMBLER by Frankie Laine, WHITE SILVER SANDS by Don Rondo AND I DREAMED by Betty Johnson. One of Joe Bennett's follow-ups was a song called COTTEN PICKIN' ROCKER (FROM WAY BACK). As a kid, I always referred to that song as the "hiccup song". For those of your readers who might be familiar with it, they will know what I'm talking about. Have a great 4th of July. But then on Tuesday we kick off a VERY special 4-Part Series spotlighting the brand new Ides Of March 50th Anniversary Box Set (4 CD's + a DVD). So be there or be square ... Next Week In Forgotten Hits!